Elvis Presley and doo-wop are not two phrases that normally go together. But, the vocal-group tradition was a profound part of the King's musical heritage, and the group sound's influence on Presley demonstrates the way the art form has infiltrated and informed pop music even if the sound is not visible on the surface. But like blues, gospel and country, the vocal-group sound was where Elvis returned whenever he needed a shot of the real thing. It was a part of who he was. Harley Payette, contributor and good friend to EIN, journalist and freelance writer passed away last week on April 29, 2013. Harley has been suffering with cancer for a fair while but at only 43 years it is far too young an age to be taken from his family & friends. Harley Payette was a very thoughtful and insightful man who contributed music articles to Goldmine magazine as well as several newspapers plus some of the best articles on ElvisInfoNet. For the last few years Harley was working to get a novel published, as well as working on a book tentatively titled "Shock of the New: the Big Bang of Elvis Presley and Rock and Roll". Harley Payette was 43, one year older than Elvis when he died. It is way, way too young. Go HERE to full obituary and Guest-Book ... ..
Harley Payette sent this article, written for Goldmine magazine, on "Elvis and doo-wop" to EIN several years ago, asking for us to wait a while before we published it on-line. Today seems the right day to remember his insightful writing and thoughts about the music world that he so loved. Presley historians have largely ignored the vocal-group tradition on Presley's sound in favor of pop, gospel, blues and country. Yet, for anyone who bothers to look, the vocal-group influence is all over. Over the course of his career, Presley, in public and in private, performed songs by The Clovers, Penguins, The Ink Spots, Coasters, The Drifters, Four Fellows, Orioles, Diamonds, Spiders, Tune Weavers, Platters and others. In addition, Presley's personal record collection featured names such as The Prisonaires and The Chantels. That's not even including gospel groups such as The Golden Gate Quartet and The Statesmen, who had a profound influence on the young Elvis. Presley's passion for the music is evident on the famous 'Young And Beautiful' bootleg made at the home of a friend in 1958: Elvis sings along with The Tune Weavers' 45 "Happy, Happy Birthday Baby" over and over again. Girlfriend June Juanico recalled, to biographer Peter Guralnick, a similar listening/singing session with The Platters' "My Prayer." In 1966, when Elvis went into a Nashville recording studio to record his first serious, personal music in more than two years, vocal group tunes dominated the proceedings. 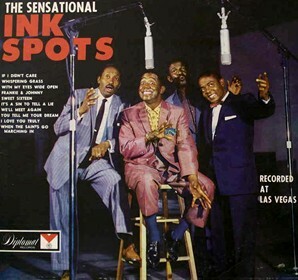 The gospel tracks featured numbers by old favorites such as The Statesmen and The Ink Spots, and three of the five secular songs came from vocal-group sources with remakes of The Clovers, The Drifters, and the former Drifters lead singer Clyde McPhatter. Like blues, gospel and country, the vocal-group sound was where Elvis returned whenever he needed a shot of the real thing. It was a part of who he was. His affinity for the form was also demonstrated on BMG's re-release of the Viva Las Vegas soundtrack on its FTD collectors' label. 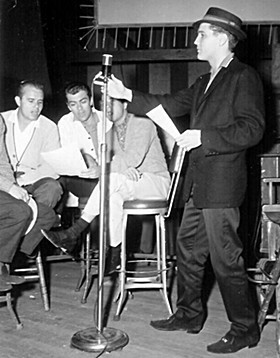 Elvis conducts The Jordanaires and even sings background on a long-lost group number called "The Climb." 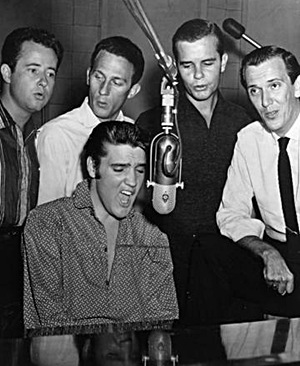 In a very real way, Presley's success would have not have happened without the influence of vocal groups. 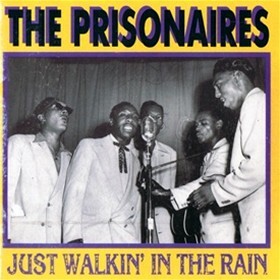 Many have speculated that Elvis was moved to walk into Sam Phillips' Memphis Recording Service based upon the success Sam had with The Prisonaires, a group of prisoners who had a local hit with "Just Walking In The Rain." Not only did the record show that Phillips was willing to take a chance, but Presley also loved the record. Lead singer Johnny Bragg was a huge influence on the young Elvis' ballad style, and Elvis was moved to visit him in state prison. When Presley finally did get the nerve to make a do-it-yourself record at Phillips' studio, he sang a pair of Ink Spots numbers, "My Happiness" and "That's When Your Heartaches Begin." 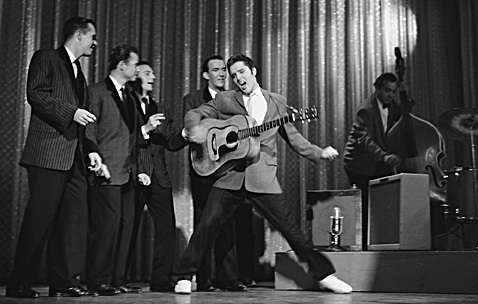 The latter recording featured Elvis trying to re-create a vocal-group arrangement on his own from the lead tenor to the bass. That The Ink Spots, not Dean Martin or Arthur Crudup, were there at the very beginning is very revealing although not surprising. Presley's high-school ambition was to be a member of a gospel quartet, the same ambition held by many aspiring doo-wop singers. 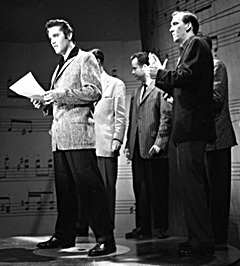 Vocal groups may even have been where Presley first saw the possibility of a gospel-to-pop crossover. McPhatter and The Drifters in 1953 secularized gospel, a long time before soloists such as Presley, Ray Charles, and Little Richard hit the big time. 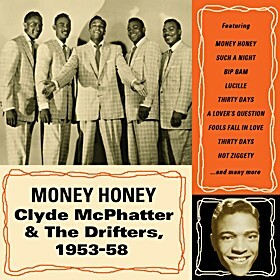 That McPhatter and The Drifters had a huge influence on Presley's musical vision is beyond doubt. McPhatter ranks with Roy Hamilton and Crudup as one of Presley's prime influences. About McPhatter, the King told Sam Phillips: "If I had a voice like that man I would never want for another thing." 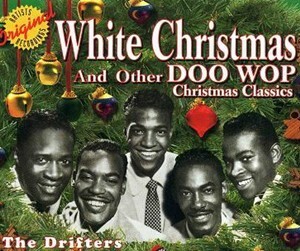 Throughout his career Elvis remade seven tracks made popular by McPhatter and/or The Drifters, including their stunning rearrangement of "White Christmas," placing them among his most covered artists. Musically the attachment to the vocal-group tradition isn't as easily made as the connections to blues and country, but it's there. Start with the presence of The Jordanaires. Presley was one of the first rock artists to incorporate a male backing group. 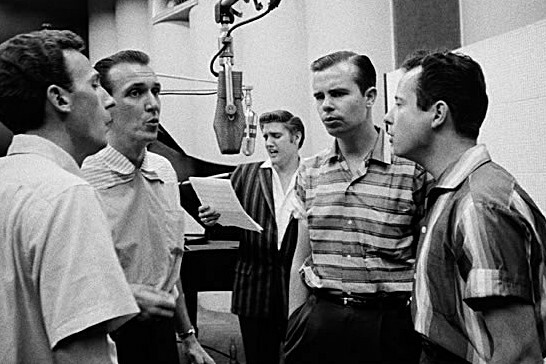 Although many of The Jordanaires have traditional pop backings, occasionally veering toward barbershop, many tracks feature innovative doo-wop tradition harmonizing. A track such as "Don't," for instance, with The Jordanaires trailing off harmonies with a booming bass following Elvis' lead, is unthinkable without the vocal-group/doo-wop influence. Arguably, a big part of what separates the sound of classic Presley tracks such as "Don't," "Don't Be Cruel" and "Hound Dog" from the early rock of Chuck Berry, Little Richard, Fats Domino etc., is the vocal-group connection. The 'His Hand In Mine' album may be the only definitive example of Elvis singing in the classic vocal-group tradition as a separate but equal member of a harmonizing ensemble. 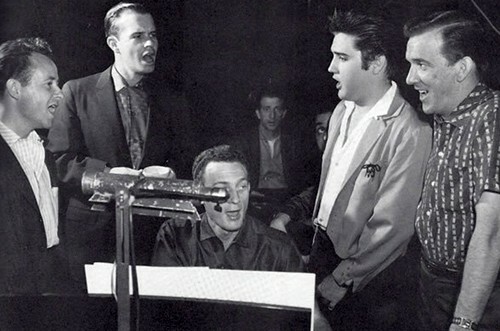 However, many tracks such as "Such A Night," "I Gotta Know," "I Was The One," "Fame And Fortune" and "She's Not You" incorporate The Jordanaires so deeply into the arrangements in a give-and-take with Presley that they would qualify as vocal-group tracks. Author Jay Warner comments in his book The American Singing Groups that Elvis sang so often with the group that he could qualify as the lead singer of The Jordanaires. Other times the musical influence isn't as obvious. For instance, Presley's decision to record a new version of "0 Sole Mio" (which turned into "It's Now Or Never") was not inspired by Tony Martin's "There's No Tomorrow" but by a remake of that song done by The Clovers. Subtle connections like that are why critics and fans have missed Presley's passion for the vocal-group sound for so long. So is the even the subtler influence of inspiration as opposed to imitation. Artists such as McPhatter, The Ink Spots, and The Clovers were a part of the reason Elvis wanted to be a musician in the first place. Even when you can't find a connection in that style, that crucial influence is always there. That's important to remember when listening for Elvis' influence on the vocal-group art. An artist such as Dion DiMucci may not betray a direct Presley influence in his work, but he has often stated it was there in his heart. And it's important to remember when listening to the pop music of today. Aficionados of the '50s, and '60s music scene may believe that the classic vocal-group sound is lost. (Though acts such as Boyz II Men are a link to that sound.) But vocal groups were there at the beginning of the single greatest career in popular music and thus the beginning of modern pop culture, so the influence is there even if the sound is not always apparent. Presley's connection to the vocal-group tradition shows that blues and country don't have a monopoly on roots. Also check out Harley Payette's previous fascinating spotlights on EIN. Go here for . .
'Blue Hawaii' - A flawed film or great success?